It’s been a month since we talked about the Vintage Garden and I have good news and bad news. The bad news comes first-the peas and spinach didn’t come up. I bought new seeds and planted again. No peas. No spinach. I don’t know where the seeds went actually. I dug into the ground after about a week and they were no longer there. Birds? It made me sad. I’ve never had a year where I couldn’t get peas or spinach to grow. Boo. See how some of the tops are missing? Darn rabbits. 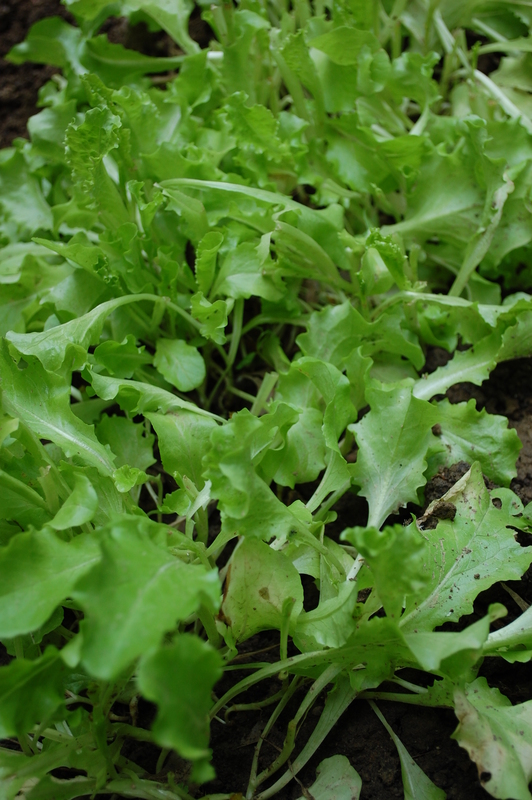 The lettuce and parsley did come up and they looked beautiful. But two days ago, I noticed a few of the tops of the lettuce were missing. Though my garden is surrounded by fence, we’re also surrounded by rabbits… and I bet they figured out a way in. Little stinkers. So I harvested it. Yummy salad time! I’ll make a vintage dressing and post it here soon. 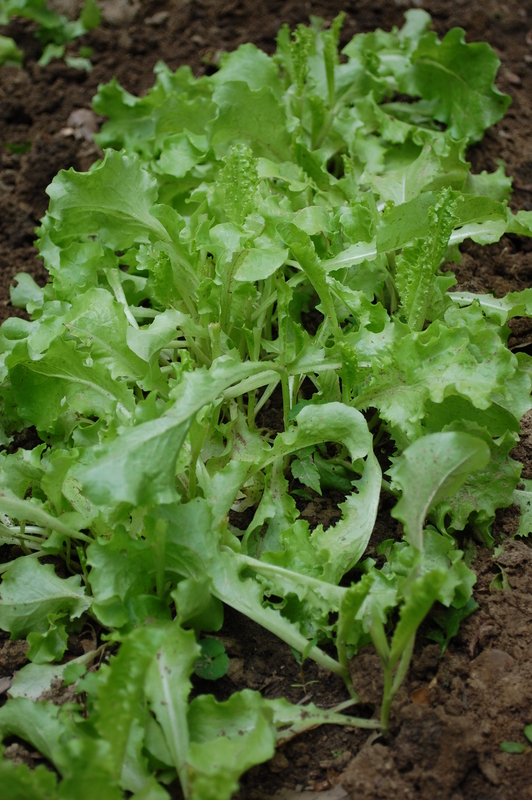 Green and beautiful… it’ll make for delicious salads. 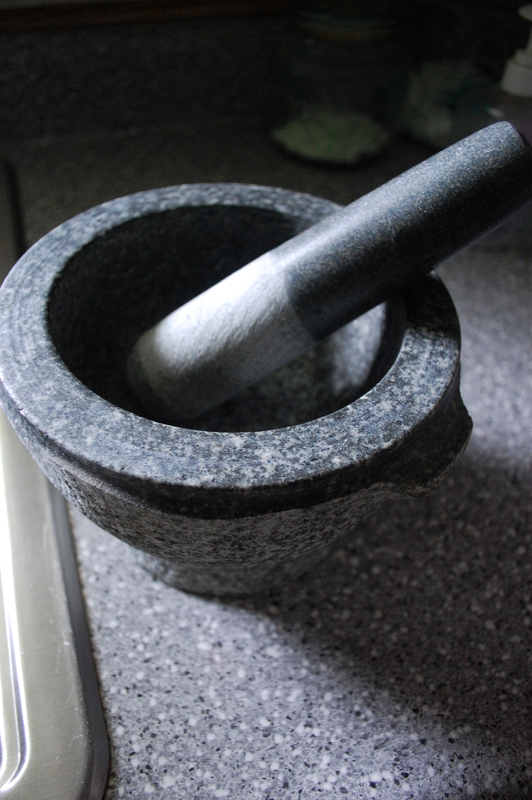 My new, beautiful, granite mortar and pestle. Thanks mom and dad! And I realized-hey, I can use that extra space to grow herbs for awesome sauces and marinades and pestos and salsa using my mortar and pestle! I was happy again. 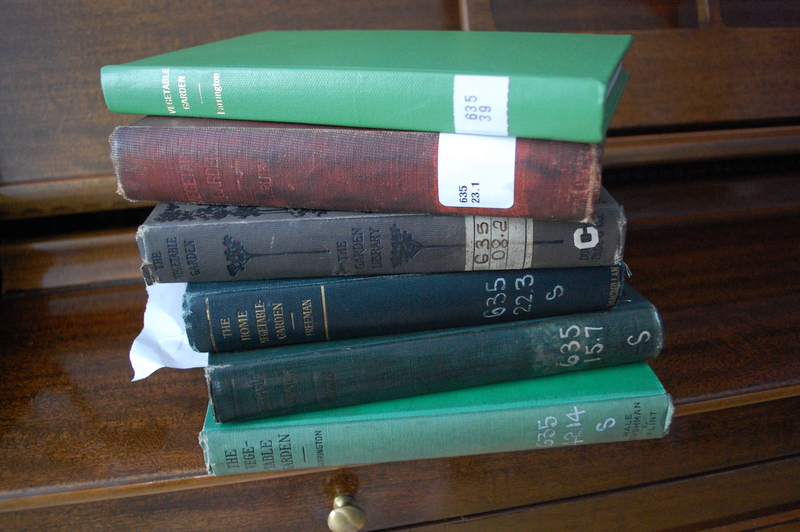 Here’s more good news-I got six awesome vintage gardening books from my library. They were published between 1901 and 1942. My collection of books, borrowed from my library. Good, interesting, sometimes alarming tips! My mother looked through them with me right after they came in. She can verify that they are, in fact, authentically old-she has an allergy to mold and mildew, and couldn’t spend much time looking through them. We did come to one conclusion on our first perusal… it’s no wonder people died young. We were shocked at some of the suggestions for fighting off pests… several of the books suggest sprinkling things like kerosene, lead, and arsenic on your plants! I’ll do a separate blog on the books coming soon. 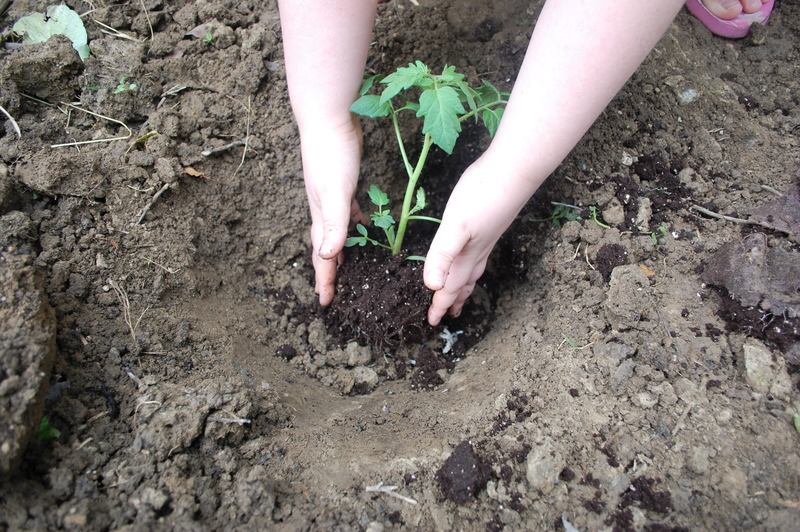 Meanwhile, I got to work planting the rest of my garden. I got everything in a week later than I wanted-thanks to a wet May, a hectic schedule, and a raging sore throat that left me the will to do nothing but eat popsicles and sleep for a few days. Alas, I recovered. And I went to Home Depot with a couple of comp cards from materials we returned after our big roof project. I bought lovely flowers for my front yard-and some new varieties of vegetables for my garden. Because I figure, if I can’t get the tried and true stuff to grow this year, maybe that means it’s a year for new things. Look, one of my plants came complete with its own worm! 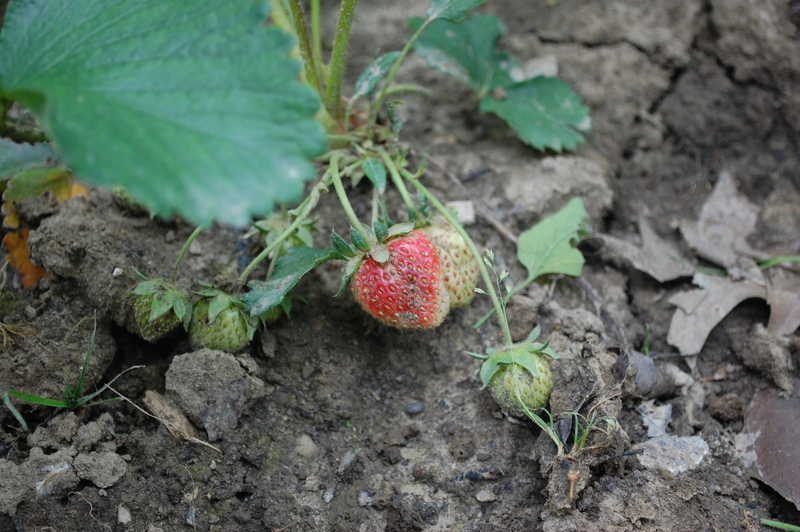 Here’s more good news-the strawberries we planted last year have fruit. And one is nearly red! I LOVE BERRIES. Seriously. 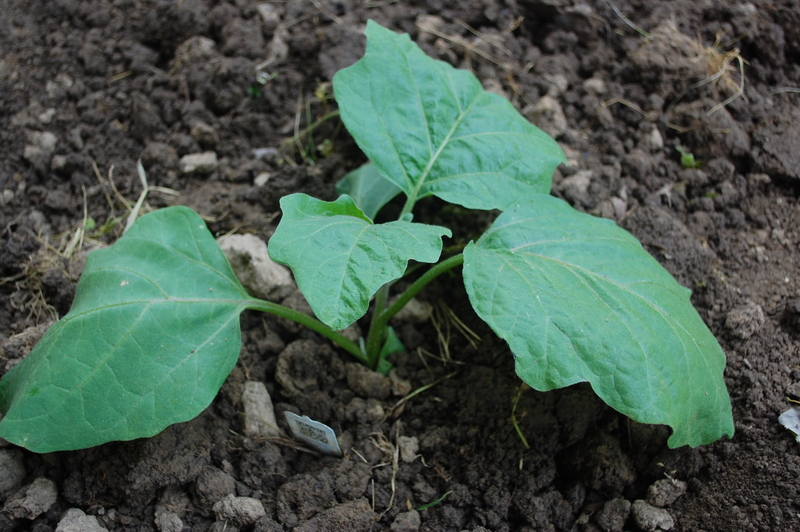 I notice several of the plants also have runners… so I’m hoping my patch grows over time. I’ll do a blog just on the strawberries at a later date this summer. Can’t wait to harvest these! 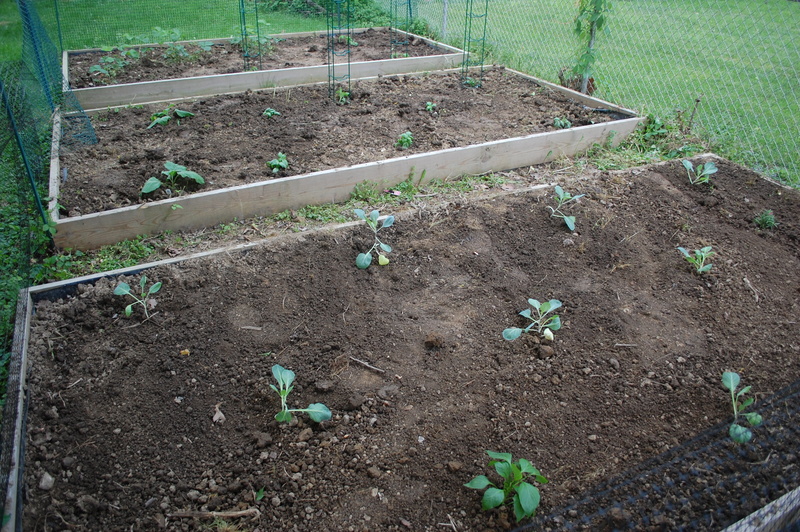 First, a big thanks to my hubby for tilling my last two garden beds. I could not have turned them by hand after my illness. That was a huge help! 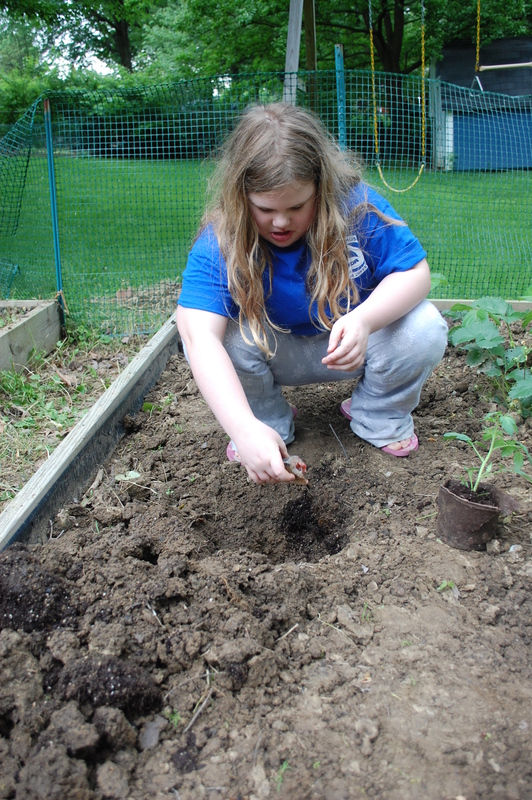 Also a big thanks to my little green thumbed nine year old daughter Ella, who was a huge help to me in the planting process again. You’ll remember it was Ella’s idea to go super-vintage and use fish to fertilize our plants. This was something she remembered from this year’s lesson on Native Americans. History.org confirms that the Native Americans planted their corn with fish-some records suggest the corn seed was actually put into the mouth of the fish and then planted. 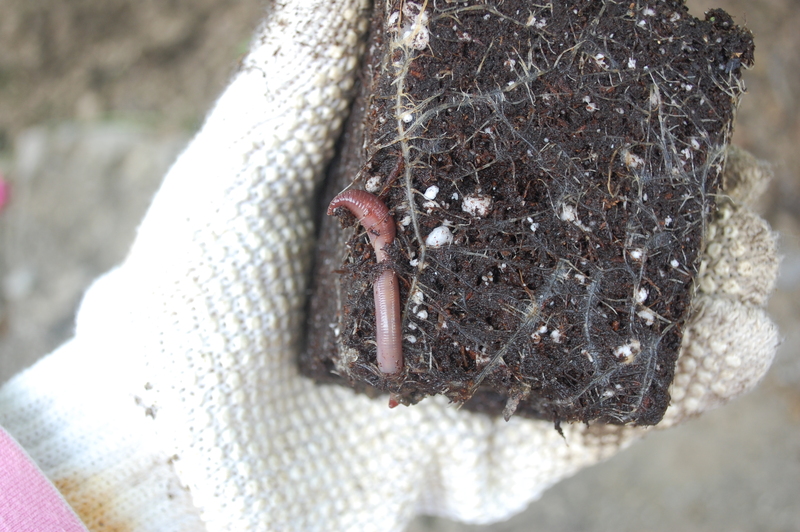 That, my friends, was the first organic fertilizer. So after I bought my plants, the search began for whole fish. I called every meat and seafood market in my area, including Jungle Jim’s. I learned a secret. Most of these stores no longer fillet their own fish-it comes to them already done. So, no whole fish or even fish heads! Guess where I found whole fish? Wal-Mart. 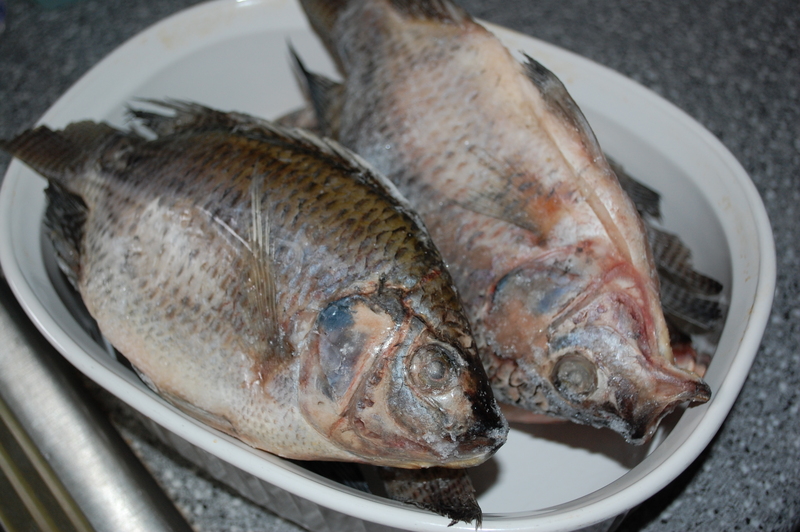 I bought six frozen whole Tilapia, with eyes and everything, for $6. Not bad. Ella and I cut the fish into three pieces each to make sure each plant got a portion. Then we set to work! We dug our holes, and put the fish in the bottom. For the tomatoes, I also threw in a few egg shells that I’ve been saving because tomatoes need calcium to reach their full flavor potential. 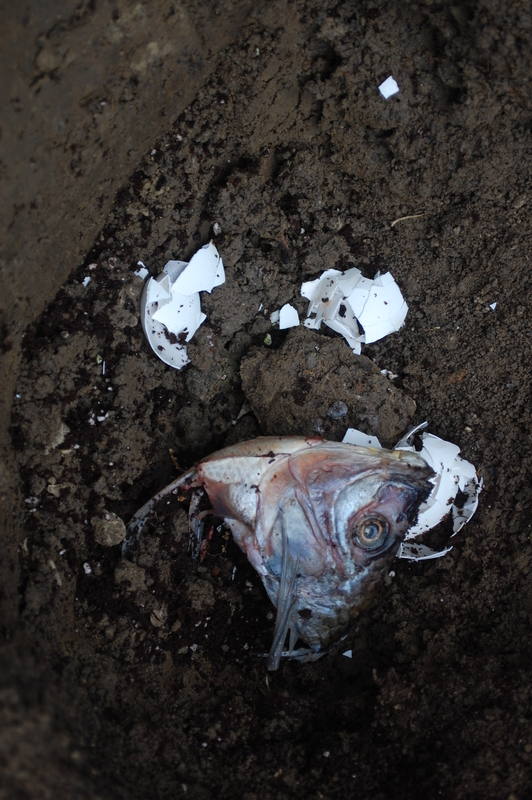 The tomatoes got both fish and eggshells-the other plants just got fish. Tomato plant goes on top! I also put in mini-eggplants..
Sweet basil. 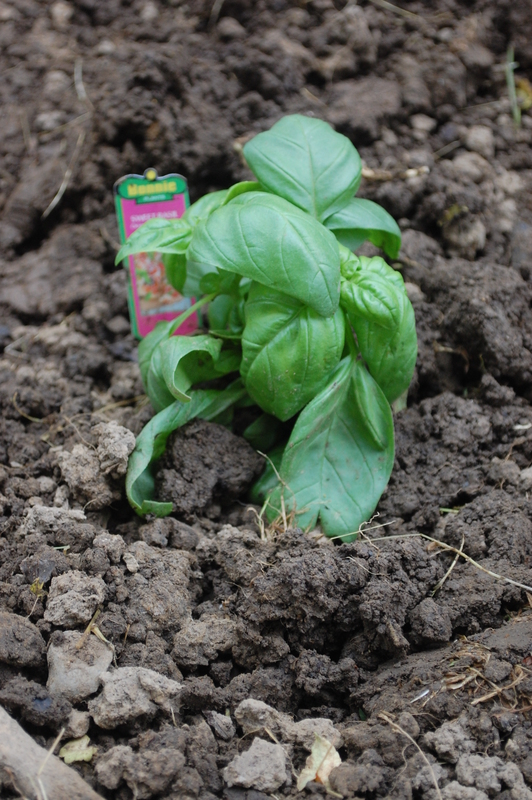 Seriously, does anything smell as good as basil? I think not. 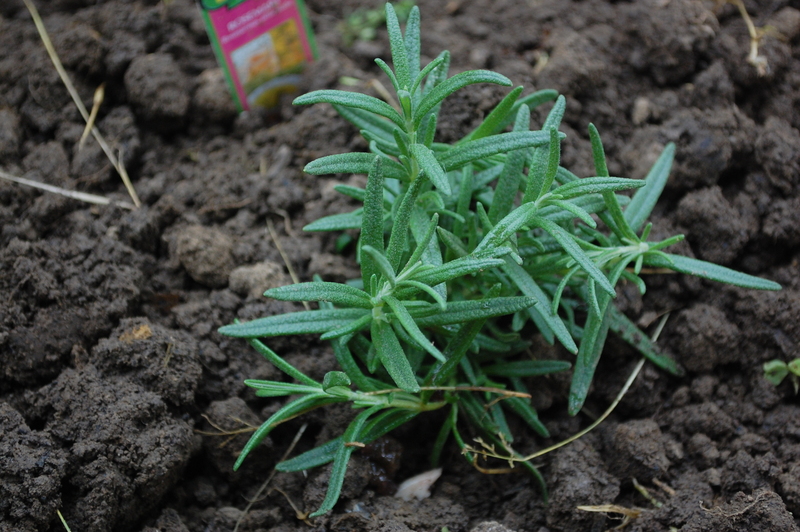 Rosemary, for use in chicken and bread! 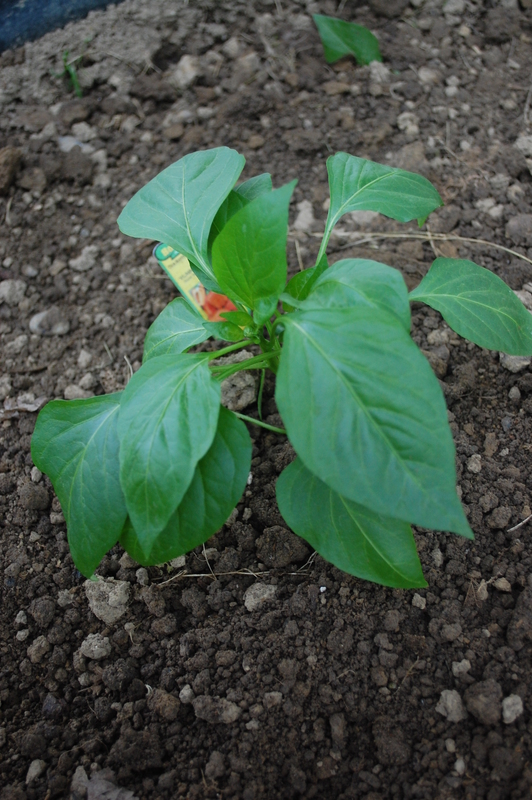 Mini-Sweet Peppers. My girls love these and their pretty expensive in the store, so if I can get them to grow, it’ll be a money saver. 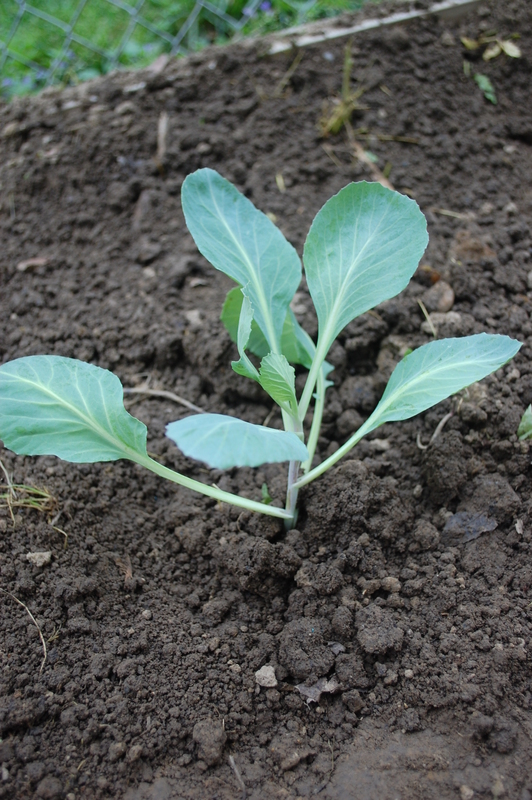 And nine Stonehead cabbage plants! Allegedly, this variety of cabbage is compact and disease-resistant. Now the fun part begins! I’ll post periodic updates as I try and keep my little garden thriving and alive until harvest! The full garden-hopefully it’ll fill out and be fruitful! I learned something new this week. Cakes don’t have to be frosted with frosting. I was searching for a unique cake to take to a cookout. 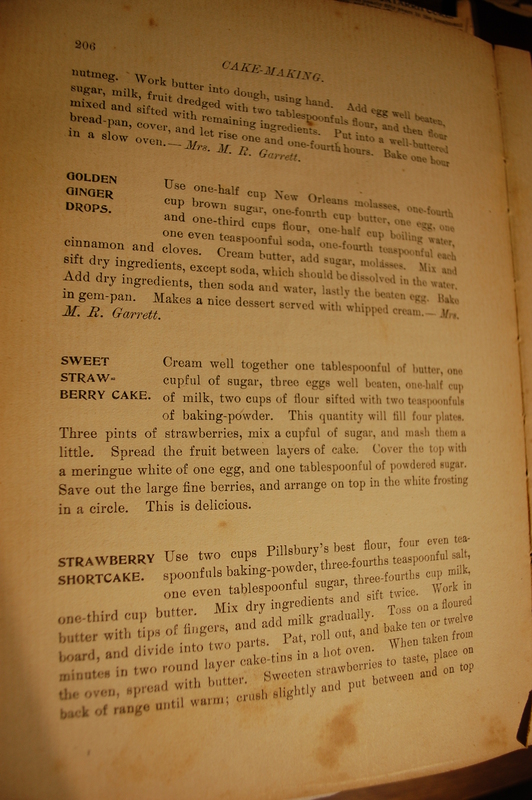 I had some strawberries in the frig and I came across this gem of a cake recipe in The American Pure Food Cookbook and Household Economist, published in 1899. I love this cookbook, because it was given to me by a friend and it’s done in old-fashioned type. These silly details make me happy. I love the font… I’m weird like that. The one thing that threw me off was the meringue frosting. I had never heard of meringue on cake. But it worked-and it was fun-and it just looks cool. I might do this all the time! The cake itself tastes like a layered pound cake. 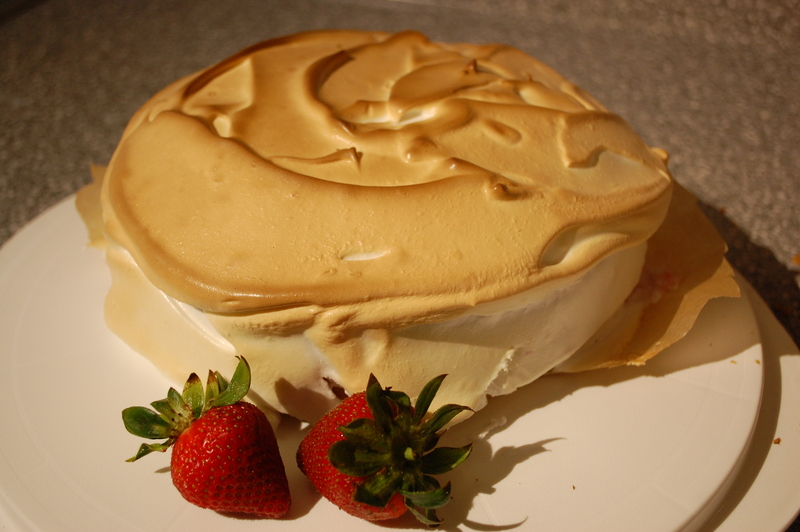 It’s rich and delicious, and the meringue frosting is a nice, light compliment. Preheat your oven to 350 degrees. Grease and flour two circular cake pans. Adding the flour to the wet ingredients. 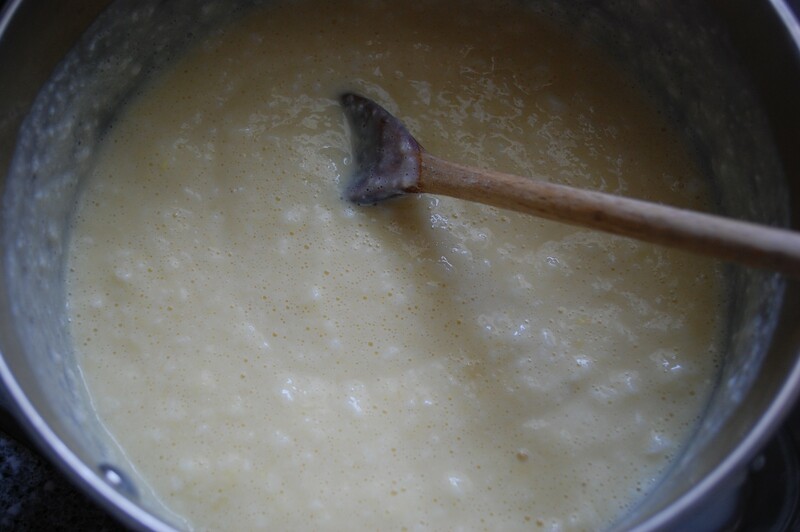 Cream the butter, one cup of the sugar and the three whole eggs in a mixer. In a medium bowl, sift together the flour and baking powder, then gradually add that to the butter/sugar/eggs mixture, mixing as you add. Add the milk and mix thoroughly. It looks like regular yellow cake from a box! 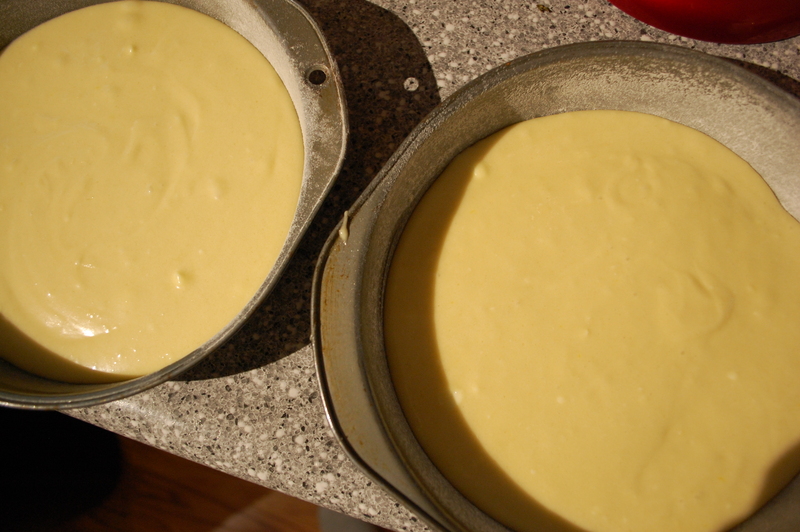 Pour the batter divided between the two pans and bake for 20-25 minutes or until a toothpick places in cake comes out clean. Let the cakes cool thoroughly, for at least half an hour. 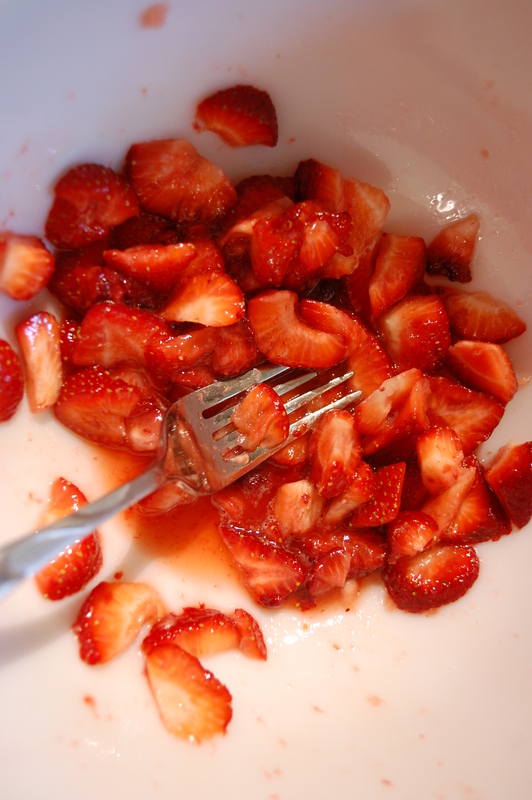 Dice the strawberries up in a small bowl and mix with ¼ cup sugar, mashing the strawberries as much as you can. Set aside. I used a fork because it’s old fashioned but you can get smoother paste by using a food processor! Line a pizza pan with parchment paper. Place one layer of cake on the parchment. Cover the layer with the strawberry mixture and then top with the other cake layer. Preheat the oven to 400 degrees. In your mixer, whip the three egg whites until soft peaks form. Add the last ¼ cup of sugar to the egg whites while the mixer is running, one tablespoonful at a time, and whip until stiff peaks form. 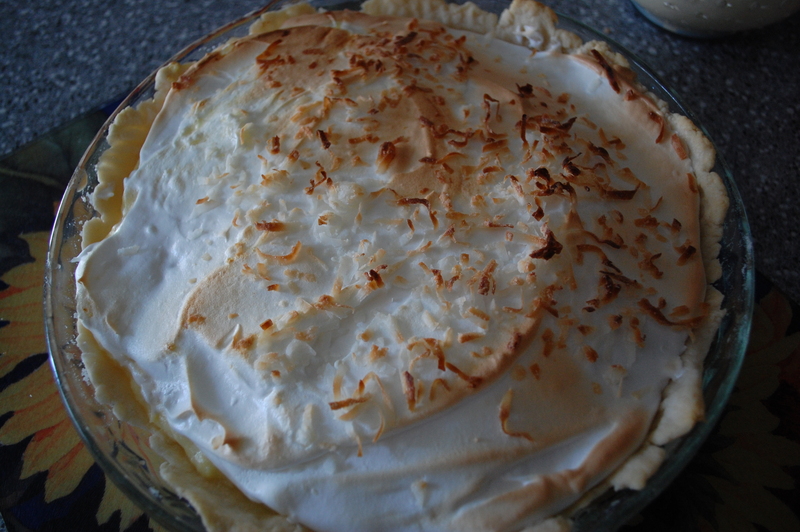 With a rubber scraper, spread the meringue all over the outside. Place the cake pan in the oven for five minutes, or until the meringue is brown. Watch closely! It has a unique look, don’t you think? Keep leftovers in the refrigerator. My girls have developed an obsession with coconut cream pie. We’ve ordered it in restaurants and gotten it frozen in the grocery store. 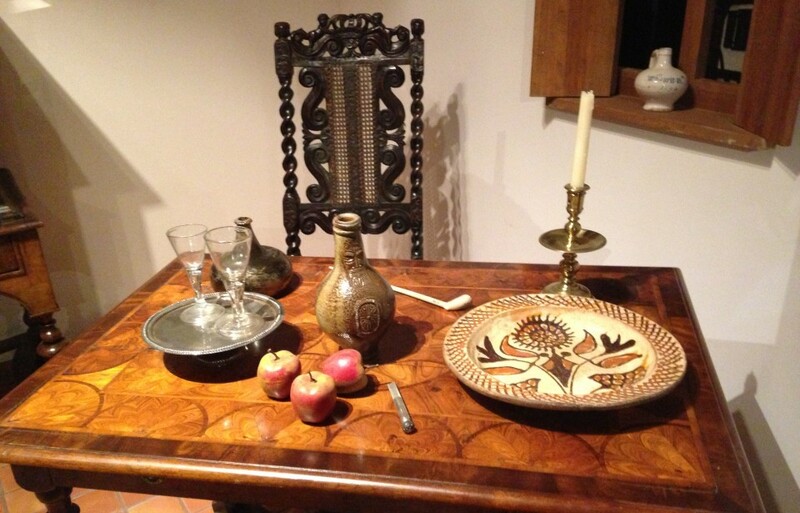 I thought it was high time that I tackled a homemade version for the blog. This was my first attempt at meringue and I’m quite proud of myself. But as I watched Babs, my KitchenAid mixer, deftly whipping egg whites into stiff peaks of loveliness, my arms ached in sympathy for those historic cooks, including my grandmother, who has no mechanical help. God bless them. The pie was delicious-creamy and really pretty. Bake the pie crust and set aside to cool. If you want to make one from scratch, here’s my easy recipe. Just bake it at 350 for about 15 minutes or until slightly brown. 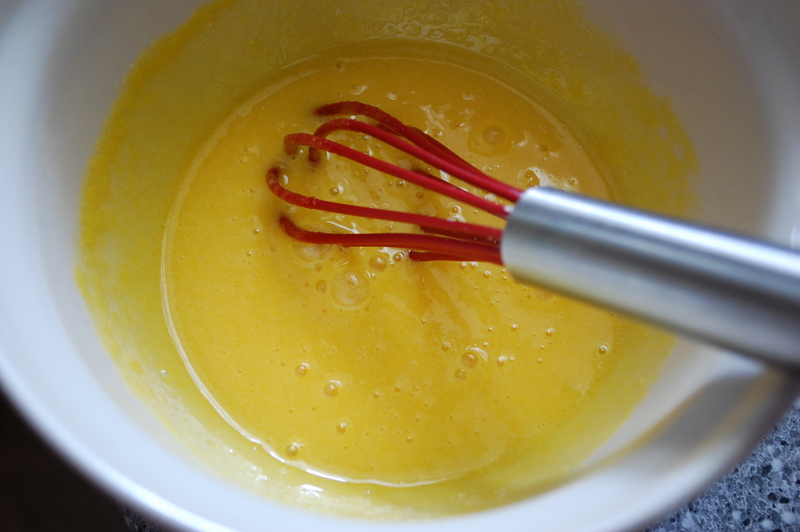 To make the filling, beat three of the egg yolks together with the sugar in small bowl and set aside. Moisten the cornstarch with the two tablespoons of milk in a small bowl and set aside. Whip two of the egg whites to frothing stage and set aside. Heat the two cups of milk in a saucepan over medium-high heat until it’s boiling. Boil for five minutes, stirring constantly to prevent burning. Reduce the heat for a moment or two, then add the yolk-sugar mixture. Keep stirring to prevent the eggs from cooking. Add the cornstarch mixture and stir until the filling is thickened. Add the vanilla and the frothy egg whites. 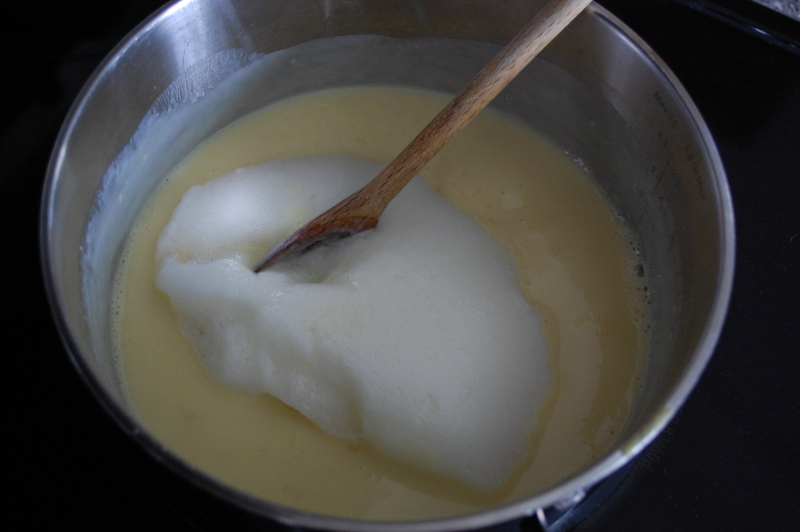 Egg whites and vanilla added to creamy milk mixture. Cook one minute on medium heat. Pour the mixture into another bowl and set aside to cool at least a half an hour. 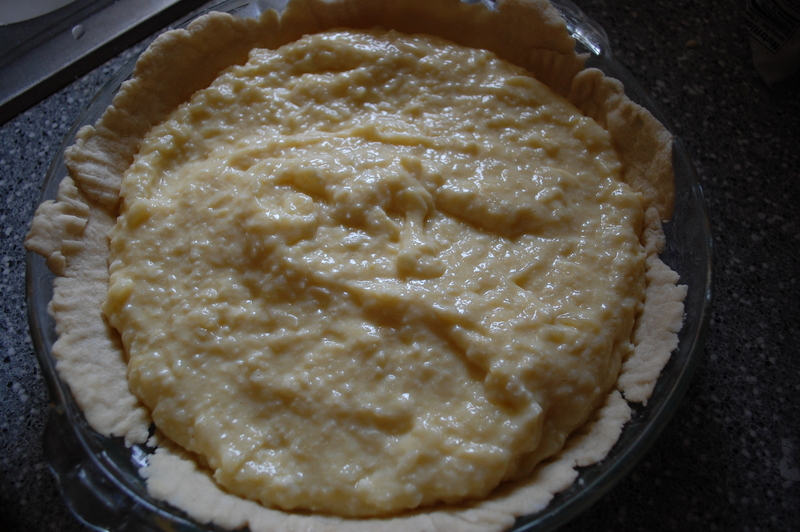 The creamy filling ready to be cooled. 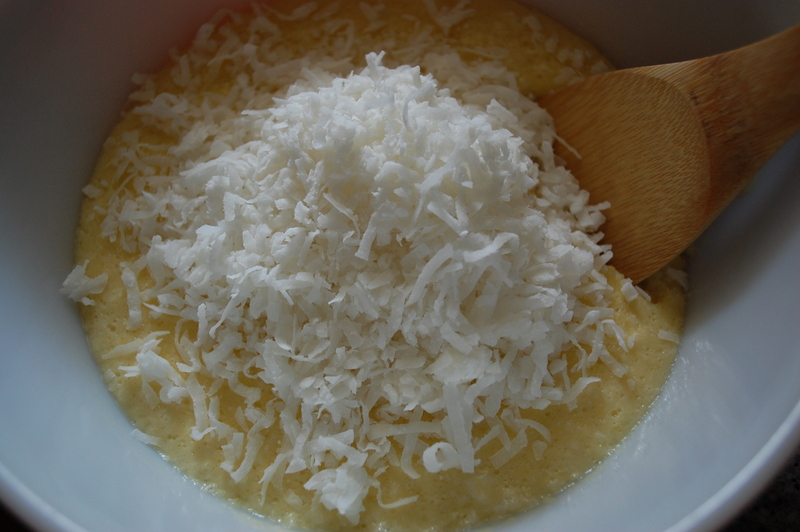 Once the filling is cooled, stir in one cup of the shredded coconut. 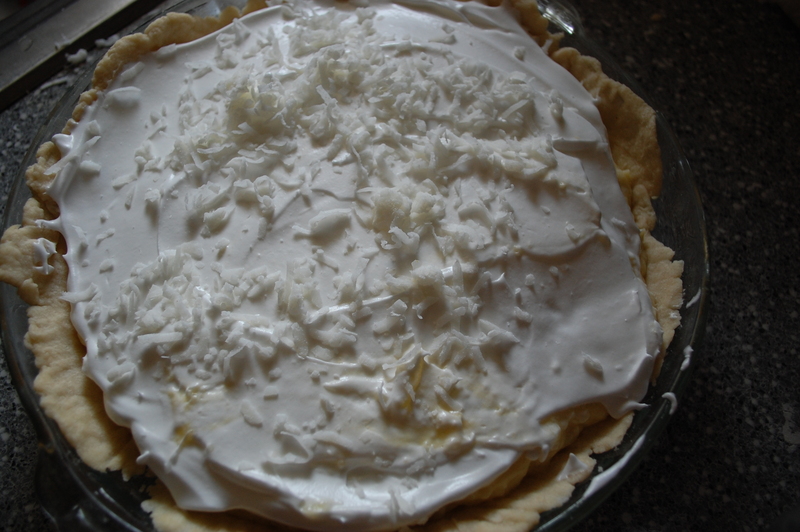 Put the two remaining egg whites in a small bowl and brush the bottom of the baked pie crust with the whites. You won’t use much. Set aside the remaining egg white for your meringue. 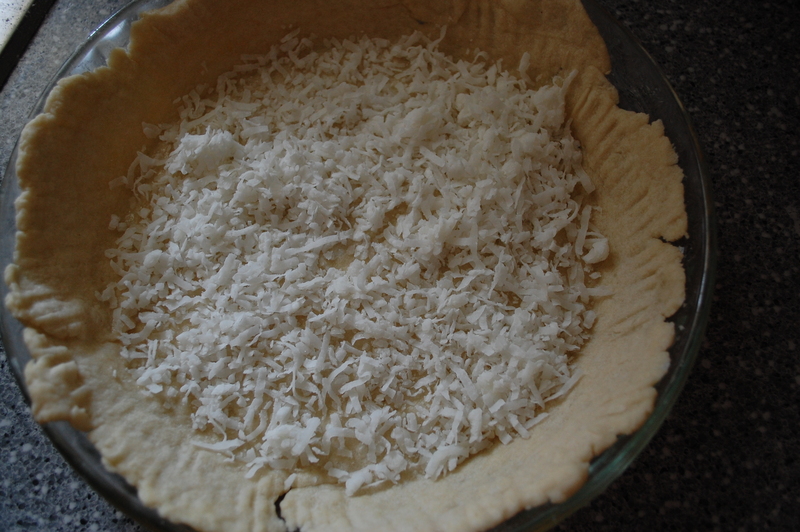 Sprinkle the pie crust with the remaining coconut. Pour the filling over the top. The filling is now in the crust! 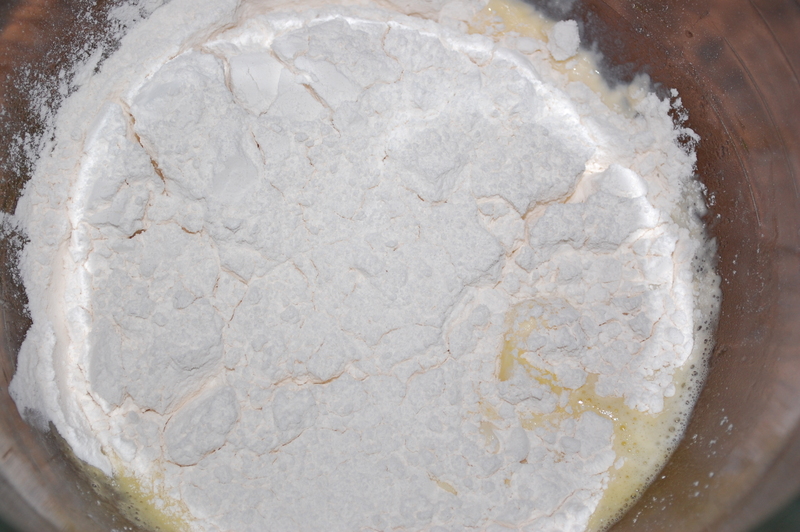 To make the meringue, beat the two remaining egg whites until soft peaks form. Add cream of tartar and beat. Add the sugar, very slowly, beating on medium high speed constantly until still peaks form. 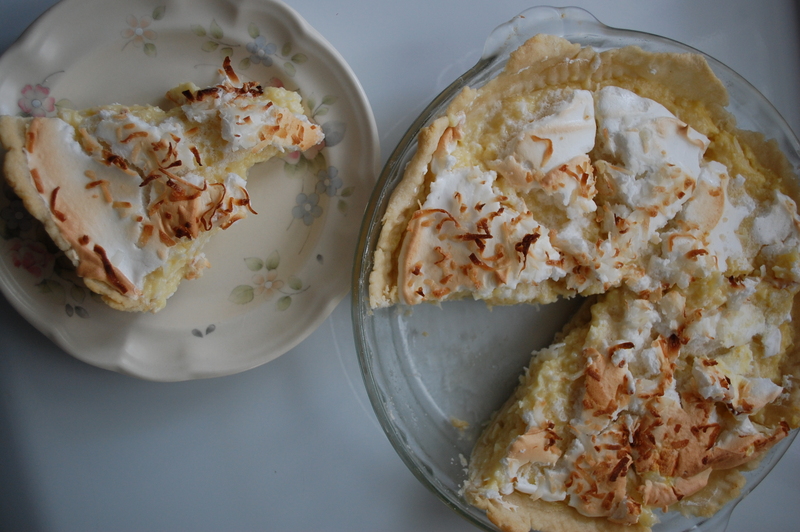 Spread meringue over the filling and sprinkles with a little coconut. It’s ready to be browned! Heat the oven to 400 degrees. Set your pie in the oven, with the rack on the highest level, and let it there for about five minutes or until the meringue just begins to brown. You might want to really watch it the first time you do this to make sure you don’t burn the meringue. Once it’s brown, remove the pie and refrigerate until serving!